Recently installed Windows 8 Consumer Preview on a Virtualbox 4.1.1 machine hosted in my Windows 7 x64 laptop on a corporate network. Also installed Visual Studio 2012 RC with the intention of testing Windows 8 Metro apps as well as preparing for the coming Windows Phone 8. 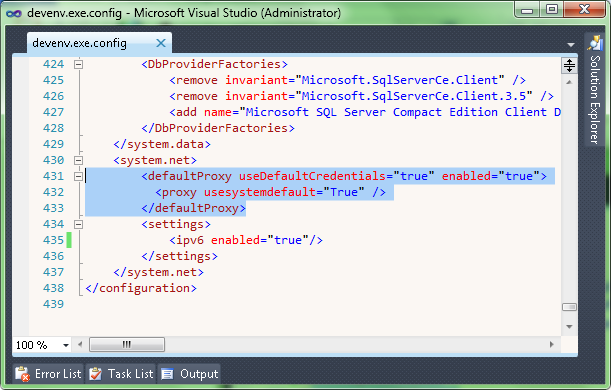 Tried the Metro 8 programming tutorials (available at http://msdn.microsoft.com/en-us/library/windows/apps/hh986965.aspx). Encountered an error when creating the project as now developers are required to get a Developer license from Microsoft online. I tried to get one but failed as the virtual machine's Host-Only network connection was not working. I realized the Host-Only adapter connection in my host machine was "Unidentified" , meaning the connection probably was blocked by a firewall or there was a security setting somewhere. So, after searching for several articles online, I found a hybrid solution to resolve the issue. 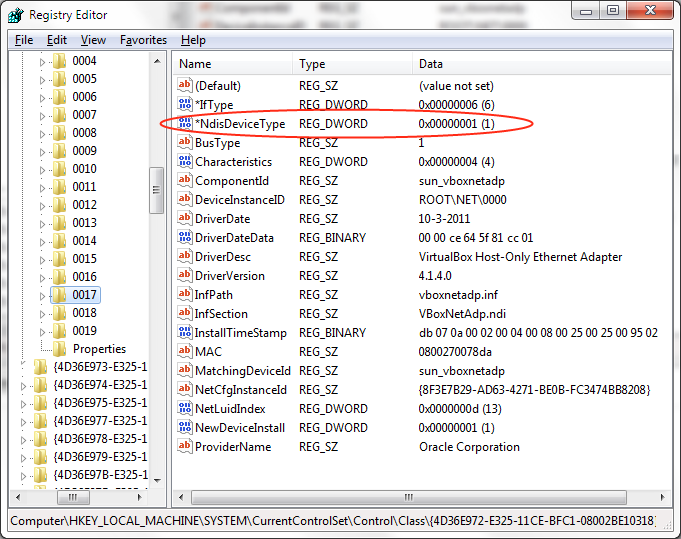 First, I edited the registry entry on my host Windows 7 x64 according to the article here. The screenshot below is from the mentioned website. However, be very careful and know what you are doing when playing with the registry. Disable and re-enable the Virtual Host-Only adapter in your host machine after modifying the registry. It should show "Enabled" now. Now, moving on to my virtual machine running on Windows 8 Consumer Preview. Inside the VM, the network connection was still showing an exclamation warning sign over the network connection. Then I tried to check the network settings and ensure that it was right. This included changing the dynamic IP, gateway and DNS to a fixed IP address in the corporate network. Next, I checked the network again but still the same sign was showing. However, this time I remembered the proxy setting in my host Internet Explorer and proceeded to change accordingly in my VM's IE. This enabled me to use the browser and go online to the Internet. However, after I tried to get the Developer license again but failed. At this point, I was a little frustrated but thanks to another article online, I found the solution. This time, I had to modify the devenv.exe.config file which is basically the Visual Studio 2012 IDE settings and added the following entry into the <system.net> section. Check out the article here. - how developer perceives each mobile platform and their willingness to continue supporting apps in the platform. - Mobile web is definintely on the fast track followed by iOS and Android. - Windows Phone is still lagging due to lack of positive perception from consumers. However, it will be interesting when the next update (Apollo) after Mango is launched. - Multi-platform development is on the rise. - Only a third of survey respondents make less than USD 1,000 per app. - Revenue comes from both corporate monetization and direct. Top revenue model for direct monetization is pay-per-download, followed by advertising and freemium. - Platform revenue potential - iOS tops the chart followed by Java ME, BB, Android and mobile web. - Exclusive distribution via each platform brings double-edge sword. Majority of developers prefer developer and distribute their app via each app store but the process of development and certifying the app might become a tedious process if the app is intended for multiple platforms. - App stores are able to reach more customers than previous app distribution channels. - Fragmentation is fast becoming the 'in' word which results different business models and costs for distribution of apps. - Developers can be hobbyists, start-ups etc. - Developers from Mobile/PC/Internet are not attracted to develop. - Market balance - Android platform is adopted by developers across Europe, North America and Asia. - Learning curve proves to be a conumdrum for some developers especially for mobile web. - Cloud APIs; iOS, mobile web and Android developers are most active users of cloud APIs. - Multi-screen; Not only smartphones and tablets, developers are also aiming for smart TVs and set-top boxes.